Rachel started music at just 3 years old; falling in love with the flute and entering the conservatoire at 6 years old. 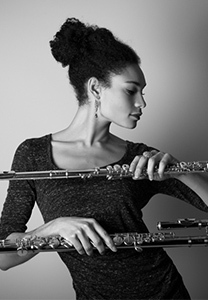 She studied with flute master players such as Pascale Feuvrier, Chrystel Delaval (soloist of the national orchestra of Lille) and Frédéric Chatoux (soloist of the orchestra of the Opera of Paris), and received her Master’s degree at the Sorbonne. Whilst studying the flute, Rachel also attended a vocal academy with Gisèle Fixe and Vania Boneva (soprano of the Opera of Paris). Occasionally a backing vocalist for artists like Ed Sheeran and Jain, Rachel has performed on many TV sets, but also in prestigious venues such as ‘Arena of Nîmes’ and ‘Zénith of Paris’. She guests on numerous studio recordings, and in 2016 she wrote and performed in her first children’s musical. At the beginning of 2017, Rachel launched her electro-pop project RoSaWay, releasing her first EP with the drummer Stéphane Avellaneda. Rachel joined ‘Murphy’s Celtic Legacy’ for the 2017 Cyprus Tour and continued to work with ‘Murphy’s Celtic Legacy’ on its 2018 French Tour. She is looking forward to future ventures with the show.